Size: 21.5 x 25.25 inches. 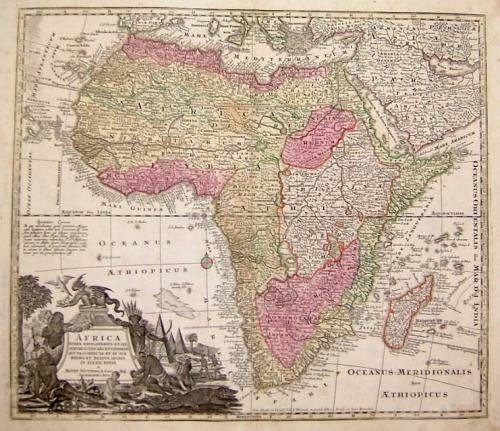 A very graphic map of the African continent with a large pictorial title cartouche containing native figures, animals, the pyramids and a dragon. The cartography of the central and southern regions is mostly fictitious and filled with erroneous detail. The Nile is shown originating considerably south of Zaire Lacus, and the Abyssinian province of Amhara is shown in the kingdom of Monomotapa. Seutter's maps are among the most beautifully engraved and highly coveted maps of the period. "An extraordinarily inaccurate map crowded with detail..." Ref: Norwich #80.